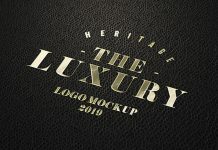 We are sharing a must have fully customizable logo mockup for designers, typographers and logo makers. A very well designed, photoshop generated yet photorealistic leather stamping logo mockup to showcase logo marks, typography, monograms, lettering, logotypes etc. There are two psd files separately shared by author, one for engraved leather stamping effect and the second one to receive embossed stamping impression. Easily change the color of the leather by using “change leather color” layer and change the text color by using the color overlay in blending option by using top most layer in layer panel. Further lighting and vignette can be customized by using “6” and “7” named layers. Do check our similar more free high quality logo mockups and subscribe to receive good mockups by email. We only share free mockups so if you won’t like our free collection you can unsubscribe any time instantly by using our link on the bottom of our email.